What’s on the minds of CXOs investigating RPA/ intelligent automation? Do you have the expertise and experience to speak at one of IRPA AI's upcoming events? If so, we're looking for buyer or end-user speakers to participate in our upcoming programs. 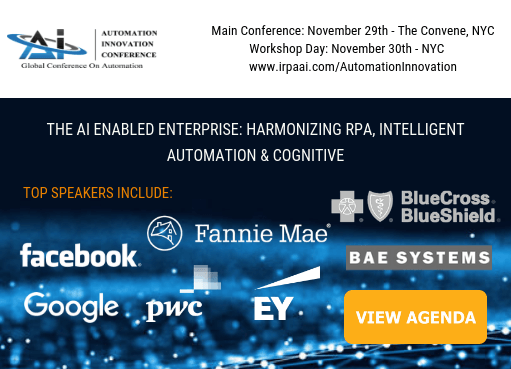 This expert panel in NYC tackled best practices and lessons learned in RPA and intelligent automation based on successes and failures of the first wave of early adaptors. IRPA AI founder, Frank Casale, shares perspectives, predictions and talks business impact of intelligent automation and AI.